The main part of this book describes the first semester of the existence of a successful and now highly popular program for elementary school students at the Berkeley Math Circle. The topics discussed in the book introduce the participants to the basics of many important areas of modern mathematics, including logic, symmetry, probability theory, knot theory, cryptography, fractals, and number theory. Each chapter in the first part of this book consists of two parts. It starts with generously illustrated sets of problems and hands-on activities. This part is addressed to young readers who can try to solve problems on their own or to discuss them with adults. The second part of each chapter is addressed to teachers and parents. It includes comments on the topics of the lesson, relates those topics to discussions in other chapters, and describes the actual reaction of math circle participants to the proposed activities. The supplementary problems that were discussed at workshops of Math Circle at Kansas State University are given in the second part of the book. The book is richly illustrated, which makes it attractive to its young audience. Math educators, teachers, mathematicians, instructors of math circles, and parents interested in general mathematical education. Why are there so few math circles, particularly for younger children? One of the reasons is the belief that very young kids are simply not ready for complex math. Another reason is that finding deep and engaging math activities, adapted for this younger audience, is itself a challenge. 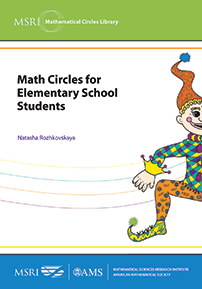 Natasha Rozhkovskaya's new book, Math Circles for Elementary School Students, helps deal with both these difficulties. Click here to view online video review.